There are a few new apps on the market designed to help people save and invest money. They don't berate customers for their inability to set aside money carefully and thoughtfully for the future. Instead, they reward you for your lack of impulse control. At first, I thought of these saving methods as silly, suitable for those with little or no self discipline. But then I considered how I have used similar techniques to steadily increase my net worth over time. When I first started working, I didn't have a lot of extra cash. But I knew I needed to set aside a bit of money. So, as soon as I could, I set up a direct deposit of $25 to my savings account. It wasn't much but it added financial discipline to my life. Because the money never reached my checking account, I never spent it. As soon as I was eligible for a retirement account at work, I started contributing to my 401(k) plan. Sadly, I never worked for an employer that matched my contributions. Nevertheless, I participated in retirement programs and am glad I made regular contributions. Today, I still have the money that I invested in my 20s in IRA Rollover accounts. Ideally, I would plan my income tax withholdings and tax payments to align with my expected tax liability. But, very often, my tax projections are too high. My deductions are often larger than I anticipated and/or my capital gains tax, lower. I try not to despair about paying too much in taxes during the year and allowing the government to use my money free of interest. Instead, whenever I happened to have received a large refund, or any refund at all, I have applied the windfall to paying down debt, funding an IRA, or boosting my cash reserve. Just like getting a tax refund, signing on for a 15-year mortgage may not be the best money move for everyone. It may make sense to borrow money at a low interest rate for 30 years and create space in your budget for investing, hopefully giving you a higher return on your investment.But, for me, the 15-year mortgage was a great way to accelerate my mortgage payoff in a way that our family barely noticed. We started with a 30-year mortgage, then financed to a lower rate (though not as low as most people pay today); our new monthly bill was about the same as our original payment. Tackling the mortgage may not have been the optimal way to use our money. But this approach provided financial discipline, which was helpful in years when we were really busy with our young family. Basically, I tricked us into becoming mortgage free well before retirement. When I first got started in investing, an easy way to invest was to set up automatic purchases of mutual funds or stocks through dividend reinvestment programs. I also sent checks of random amounts whenever I had extra money in my bank account. I didn't have a master plan to accumulate a certain amount of money; instead, I invested when I could.Today, I can invest similarly through automatic deposits to purchase mutual funds through an online brokerage firm or ETFs through a robo advisor. In some cases, I may be required to make a fairly large initial deposit (perhaps $500 to $3,000). But after setting up the account and making that first deposit, it's pretty easy to make regular contributions, either in random amounts or a specific amount monthly. In fact, I invest $100 monthly in Betterment. This technique can work well for saving for long-term, non-retirement goals such as home renovation projects or the purchase of a new car. Getting started in saving and investing can seem very hard. But when I've embraced mental laziness, it's easy to trick myself into saving. Without even thinking about what I'm doing, over time, I can increase my net worth substantially. 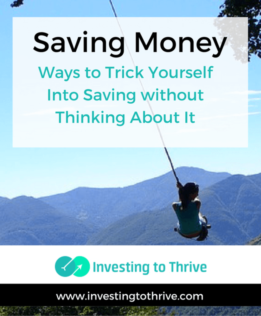 Have you tricked yourself into saving money? How has that worked for you? Sometimes silly works! It’s all about getting something automatic and someone might be more willing to sign up for a thing like Digit or Acorn than navigate their bank account to set up an automatic transfer. Whatever works!